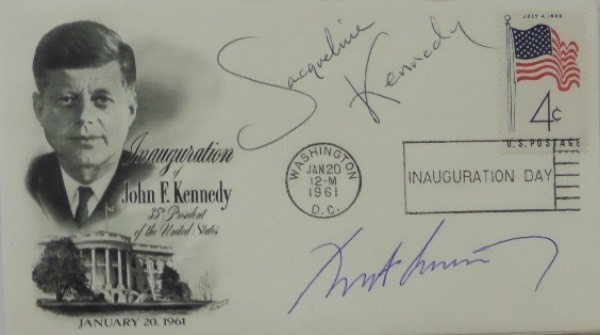 Coach's Corner - John F. Kennedy & Jacqueline Kennedy dual signed Inauguration cachet! Go Back to Lot List John F. Kennedy & Jacqueline Kennedy dual signed Inauguration cachet! This January 20, 1961 stamped cachet commemorates the Inauguration of John F. Kennedy, and comes blue ink-signed by the man himself, as well as blue ink-signed by his First Lady, Jacqueline Kennedy! Signatures are 8.5's at least, and was obviously signed during his Presidency, at least by JFK. A real find for those interested in Americana collector's items, and retail is thousands!